I held out on getting a smartphone for quite awhile. I didn’t want the extra expense of a data plan. I didn’t want to spend more to purchase a phone. I rarely even talked on my phone and didn’t text at all. I basically kept it for emergencies or to find my family when we got separated in stores. Once I finally got that smartphone, I saw how valuable a tool it can be. 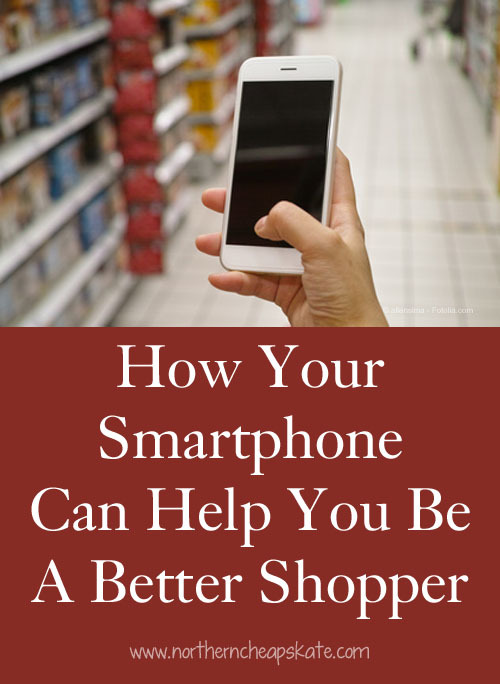 I’ve found that your smartphone can help you be a better shopper. I’ve had my smartphone for a few years, and in that time, it has helped me save money in ways I never imagined. It’s helped me find coupons and savings and helped me to be more intentional with my purchases. The camera function is one of the most useful tools on any phone – plain ol’ cell phone or smartphone. See something you might want to buy for yourself or someone else? Take a photo of it. You may be able to find it elsewhere (or make it yourself) for less. By waiting to buy, you may look at that photo later and realize that you don’t want the item after all. On the fence about whether to buy that end table you found at a garage sale? Snap a picture and send it to a loved one for a second opinion. Here’s another way to use your phone to save money: I needed to replace the starter in a fluorescent light. I used my phone to take pictures of the part (along with their identifying part numbers) to make sure I didn’t waste money buying the wrong thing. I’ve taken photos of other items like furnace filter sizes or cordless phone batteries so that I can get exactly what I need at the store. May the list be with you. I often put my shopping list on my smartphone so that I always have it with me when I’m out shopping. If you make your lists on dry erase boards at home, just snap a picture of your list with your phone. Otherwise, you can use the “Notes” feature of your phone. I use an app called Evernote and I love it because I can sync it across my computer, tablet and phone. I can also easily share the list with my husband who also has the app. After I do a clothing inventory of what my family has and what clothing they need, I can enter that information onto my phone along with the sizes needed. Then, when I see a great clearance sale or a great bargain at a garage sale, I can check my list to make sure it is something we need. I also use my phone to keep track of gifts I’ve bought and gift ideas. And when it comes time to tackle school shopping for three boys, an electronic checklist on my phone makes it easy to keep track of what I’ve already bought and what we still need. Having a detailed list with you at all times can prevent impulse buys or buying the wrong things. It makes it easier to take advantage of sales, too. You save gas when you combine trips and avoid driving back and forth across town, so make the most of your errand-running by mapping out your trip. You can use your phone’s built-in map function, or you could even use an app like MapMyRun to help you plot your trip. This will especially save time and money when you’re hitting garage sales. You might have to go to the store to get things, but you don’t have to leisurely wander the aisles, finding more things to add to your cart. Set the alarm on your phone to just a short amount of time in the store. You’ll stick to your list and be less likely to impulse shop. If I stumble across a great deal on something I want, I’ll use my smartphone’s web browser to search for more information on it. I’ll make sure to look at reviews, check out any FAQs on the product, and comparison shop to make sure I really am getting the best price. It only takes a couple of minutes to use your phone to look up this information, but it can save you some serious cash if it prevents you from buying something that’s a piece of junk. It can also help ensure that what you’re buying is the best quality you can afford. Keep your store loyalty cards in one place. Many smartphones have a “wallet” feature that allows you to store the information from all your store loyalty and rewards cards right on your phone. Since most people always have their phones with them, they can use this feature to make sure they don’t miss out on freebies and deals. Make sure you’re getting the best deal possible by using your phone’s calculator to determine unit prices. For example, you may have a coupon that makes the per-ounce-cost of pasta less than if you were to buy a larger box. A quick calculation can tell you which package yields the better savings. You can use it to calculate percentage off or to calculate sales tax. And you can use it to keep a tally of how much you’ve spent as you shop so that you don’t face any sticker shock at the checkout. Most stores and restaurants will text you special coupons and sale information right to your phone, so if you have texting included in your cell phone plan, be sure to take advantage of these deals. I’ve gotten deals like buy one, get one free offers and 25% off coupons. Use shopping apps to save money. Sign up for apps like ShopKick which reward you just for visiting your favorite stores, scanning items and making purchases. Shopping apps like Favado can help you match coupons to sales. Store apps, like Target’s Cartwheel can alert you to special sales and unique store coupons and savings. And there are plenty of cash-back apps that will give you cash back for purchasing specific products. Using these apps can help make shopping easier and keep money in your pocket. If I see a book or movie I’m tempted to buy, I’ll check my library’s online catalog with my phone first and reserve it right there. Now I can enjoy the item without spending a dime! If I see something else I’m interested in buying, I add it to my Amazon wish list using my phone . Sometimes I discover that if I do that, and let a bit of time pass, I’m no longer as excited about the item and can take it off the list. Money saved! Get talked out of a purchase. Sometimes you see a great deal, and you’re not sure you should spend the money. That is the point where you pick up the phone and call or text a trusted friend or family member to give you their honest opinion. When I’m feeling especially “at risk” for an unnecessary spending spree while I’m running errands, I’ll pick up the phone and chat with someone while I shop. The talking distracts me from buying things I don’t need. These are just a few examples of how you can use your smartphone to become a better shopper. Once you start taking advantage of all of the money-saving tools available to you on your smartphone, you’ll find that your smartphone quickly pays for itself. Now it’s your turn: What are some of your favorite ways to save with your smarthphone? I’d love to get rid of all the stupid cards that I have on my keyring or in my wallet. I’m definitely going to have to look into that ‘wallet’ feature that you touched on. Many of the loyalty cards companies will email coupons for that store. Most stores can scan the coupon code on the email eliminating the need to print coupons. I also email the lists of what coupons are “loaded onto my store card” to myself. That’s a great tip! Save time, save ink and paper, too! I have to make sure my phone is fully charged when I go shopping! I typical trip to Target for me involves Shopkick, Cartwheel, mobile coupons, shopping list, and calculator!